I encountered this manifesto while we were visiting my sister-in-law and her boyfriend in Valencia. 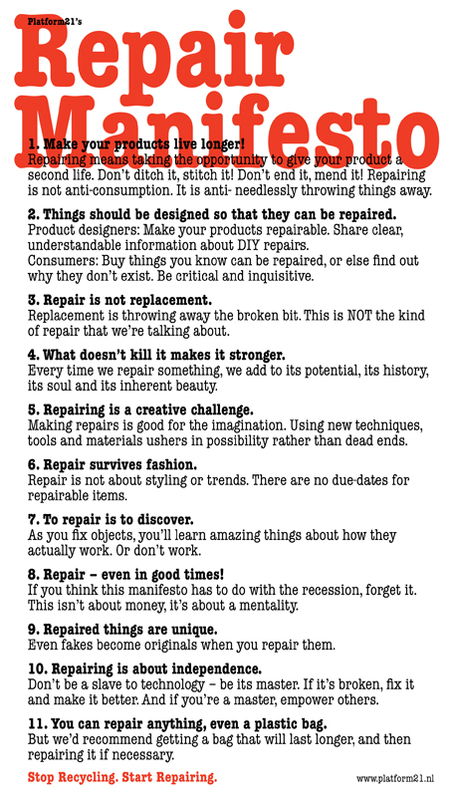 He's an engineer and therefore much better than me at fixing at least technical things but I like this manifesto non-the-less, it's never too late to learn and you can always ask for help, right? Additionally, there are nowadays a lot of webpages that can help you out with different things, like howstuffworks and iFixit. I started the holidays by following the rules above and fixed my jumper which had broken. I hate it when my favorite jumpers break! That's probably one of the only downsides with shopping less, you wear your favorites a lot more, which wear them out. On the other hand, you learn to know which are your favorites and what to look for when you need a new item. The jumper in question here though has seen a good amount of years already but with some stitches I hope it can survive a few more. The manifesto can be downloaded here if you feel like having a print-out or sharing it.